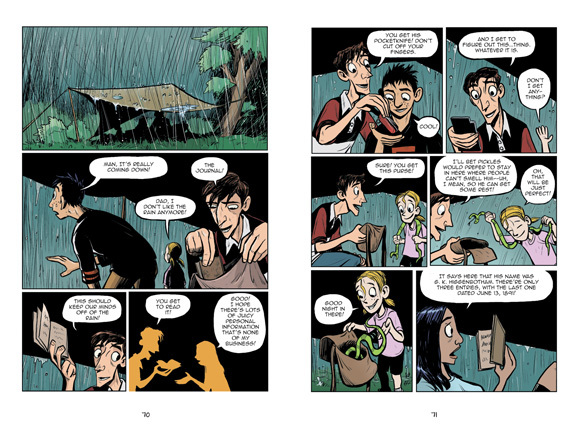 TenNapel uses flashbacks and moments of suspense to illustrate both the tension and the love between father and son in Bad Island in both story lines. When the family works together on Bad Island to make sense of the strange plant life, markings and creatures they encounter, they grow closer and the danger feels a bit less ever present. As noted in a review for School Library Journal, "There's a tenderness that the characters have endured and helps to round them out and make them more believeable. You actually can feel the love and strength that the family has built their foundation on since the birth of Reese." Best of all, though, is the comic relief from Janie and her stowaway pet snake Pickles, who does not survive the shipwreck. TenNapel's creature creations are creepy and brilliant and echo some of the creations of filmmaker Hayao Miyazaki, especially his films Nausica and Princess Mononoke. Like Ghostopolis, Bad Island is a book that demands multiple readings. First, read for the fast paced story. Second time, read for the detailed creatures. Third time, look for clues you might have missed in the first two readings. I can't wait to see what Mr TenNapel conjures up next!